It was high time for another upholstery project and being lucky enough to work alongside an experienced upholsterer at my studio we decided it would be fun to try out a 4-Tier Screen to showcase my fabric. The screen itself was in desperate need of some TLC having gathered many years of dust, so Pete set about stripping and vacuuming the frame. The original backing paper had disintegrated so it needed taking right back to the wooden frame. The next stage is preparing the screen for covering, which I always think is rather the beauty of upholstery. So much work can go into this stage, particularly with a complex stitched in seat for example, and the end result always look so effortless and beautiful, or it should anyway! One of the many reasons I love and respect upholstery. For a screen like this, Pete removed the hinges which had rusted beyond recognition and made a careful note of the order of the screens. Then working on each piece individually Pete stapled a combination of Wadding & Interlining to give the wooden frame a smooth and substantial covering, that also wouldn't let the light shine through. The next stage, putting on the fabric. Pete and I decided to use Clams on one side of the screen, and Bass & Hook on the other - this piece has been designed as a showcase for my fabric, and one also that I hope will live happily in a customer's home in the future. By giving a customer the choice of two colours and designs they can use the screen according to their living space. As with all upholstery jobs, the time spent temporary tacking and stretching the fabric to the frame is the most important. 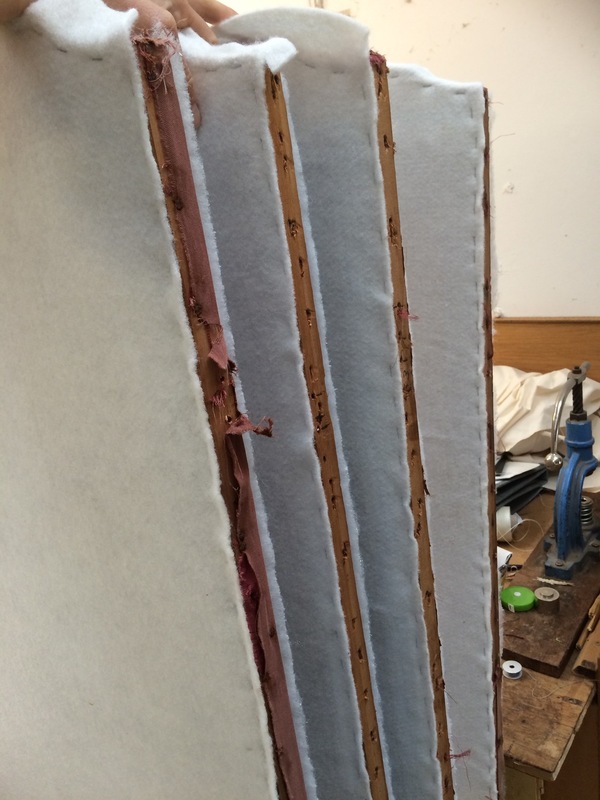 Once tacked in position Pete can then follow round securing the fabric with the staple gun. In layman's terms the secret is to run north to south, east to west and then work gradually around each of those compass points ensuring that the appropriate amount of tension is applied to the fabric. Clams went on perfectly, next up Bass & Hook. Same again, but this time turning the edges to ensure they meet perfectly in the middle of the edges of each piece. We chose stainless steel hinges to replace the original brass ones, as we felt they would be more in keeping with the natural colours of the linen. Once the screen had been covered in Bass & Hook, the next stage was to hinge the screen back together. Finally, choosing a natural braid to compliment both Clams and Bass & Hook Pete applied braid to hide the joins of the fabric around the circumference of the screen and give the screen a lovely finish. I'm absolutely thrilled with the end result, it makes the perfect showcase for my fabrics and would be a fabulous addition to a home too. You can see this screen on display at the Purbeck Artisan Yard at the moment, and if you would like further details or to purchase the screen please email me via my contact page.